Learning to read the Bible as a Self-Help Book. Everything in the Bible is really about you, because YOU are the World of Creation. The Bible is written like a mirror of greater and smaller truths that continually reflect back upon themselves. This inner world of the psyche (Soul) is made up of elements of truth that were gathered and crafted by the physical world around you, and as such the mind’s landscape uses similar concepts when it reasons things out. For this reason we dream in images of people, places, and things. The entire Bible is made up of this vocabulary of dream related imagery, and since dreams are simply unfiltered thoughts they are built of the unconscious imagery of the world of reason. Ironically, once you understand how the mind works; dreams begin to make more sense. Remember, the entire Bible works off of allegories and parables and everything written in it is really detailing a story of mental development that eliminates the frustration of ignorance and heals the mind with clarity. This theme is the process of bringing light to a dark world. This self-reflecting process of reason uses the entire mental landscape to determine different elements of truth. There is a constant shifting from above to below (and vice versa) using an entire macro- microcosmic universe of comparatives. In this mental world people are one of the primary components and take on the role of a concept, and a kingdoms become a congregation of many of these supporting ideas and thus create a state of awareness. In this world of the mind the king of a kingdom is really the leading concept that dominates a particular state of understanding. So, in the Bible a kingdom is really a state of being, or the extent of one specific understanding. The whole Bible is written like this. It’s like a code of sorts, and if you don’t have the keys to unlocking what each element of the inner world means, everything will get mottled and confused and all you will see is the stories at face value and not see the hidden truth that’s detailed within them. A reflection of that object. The entire landscape of the inner world is built up of similar elements that reflect upon these 3 aspects of self. It doesn’t matter if it’s a Mountain or a Kingdom, they are both governing principals of the higher self. A Father, a King and the Sky are also representative for your higher elevation of understandings, but they will have subtle differences to their meaning. It may seem a little complicated at first, but this is, after all, learning another language (The language of tongues). Give it some time and try it out. Learn these KEYS and use the supplied color chart to see how each element of inner truth applies to the: ideal self, true self and natural self. We will then use these KEYs for all our lessons to come. Take the Bible Verses blocked out in RED above and use the chart below to see what the Bible is really telling you about your mind/soul. Any establishment of many smaller concepts supporting a greater supposition. Did you know these two books; Genesis and Revelation are directly related? One is the start of a journey and the other is its completion. If you think I am talking about it being the journey of the world then you’d be right… and wrong. It’s probably not the world as you may picture it, because the world is really YOU. 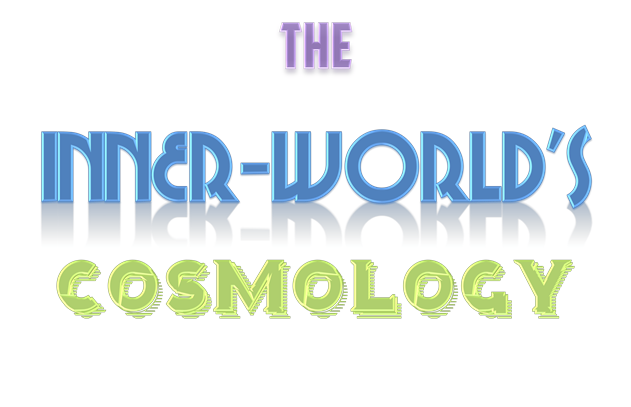 Cosmos (Kosmos: κόσμος) is the word used in the Bible to describe the WORLD by the ancient Greeks. It is used today to describe the entire known universe because it really means the divine order in all things. In everything is an order, be it a chaotic one or a structured one. In this case the “world” that is mentioned in the Bible is one of both chaos, and order. The Bible starts with mentioning a world that has no “Form”. This is a lack of true order that has no set structure. This is your lack of discipline and a presence of disarray in your mental reasoning. This inner world is also “Void” of understanding and therefore it is unsatisfied and empty. And most importantly the inner man is without understanding and lives in a cloud of “Darkness” called ignorance. The secret truth that most people miss while reading the Holy Scriptures is that the entire Bible is really about themselves because they are focusing on the stories at face value and missing their symbolic context. The Bible starts with laying out a foundation that spans the entire book, but it is dismissed as a tale of the Creation origin story of the planet Earth. This however, may or may not be the truth but there is no way to know because no one living was ever there. We just accept this as truthful because the Bible tells us this is how it all started. But the reality of the story is not the focus of this lesson. The main focus is on what this means to you as a person living today. People suffer with faulty ideals that plague their entire lives. As humans we won’t do anything without considering it on some level first, and if it doesn’t match up to our personal guidelines we will not do it. Everything we do is governed by rules that are set in place by our own belief system. But if that belief system is without proper understanding the system is ruled by a chaos that constantly causes problems to itself and others. You may have heard it said that “Knowledge is power” and that’s true, because a lack of understanding leads to a chaos that is easy to exploit and you may quickly find yourself in a dangerous or uncomfortable situation. The first part of the Book of Genesis is actually detailing a 7 step process that is meant as a basses in which to create an orderly mind. Most people mistake these as 7 literal days, but the word used for a “day” is a general reference for any period of time (Be it a day, season, year, etc.). Look also at this verse in the book of Deuteronomy and you will see that a day is the same as a shoe, or rather a means of taking steps. It’s easy to miss the subtlety in definition because of how it is written, but it is telling you that your shoes are as days. These “days” are a period of time that is easiest to understand as a step or more importantly as a stage of development. Think of the days as steps of enlightenment or a time or period of personal growth. Then this means that the first 7 days of Creation are really seven steps that help you to grow closer to God. Now in this case you are the world and you are in need of mastering yourself from following faulty ideals and thus you are becoming a reflection of the true God that rules the physical universe we all live in. As a microcosm of the macrocosm your higher reasoning takes on the role of the God of the inner world. In most cultures we use the term MASTER to claim the role of a great teacher, but the Bible instead uses the word LORD to describe the MASTER of a home, kingdom or world. Consider the world is your mind’s abode and the higher brain is the LORD or MASTER of the house. Therefore YOUR HIGHER REASONING is the LORD or GOD of the inner world. Only with this new perspective will the Bible truly begin to reveal its greatest secrets. To become the master (or Lord) of the inner world you must reflect the True God within by understanding as He understands. These seven easy steps in the book of Genesis are the path to gaining ultimate understanding, but there are some subtleties to understanding each “day” as a stage of development. However this post is not long enough to explain each day but we will look into these details in later posts. However the main point is to see that these same days are periods of enlightenment that are symbolically represented as other corresponding imagery. Now let us take a look at the last book of the Bible that most know of as the Book of Revelation. A revelation is not about something to fear but something to be in awe over. It is a time of joy that most know of as the RAPTURE. Many Christians fear this last book and I never understood why since it is about a glorious revelation of great joy. Maybe it is because it chronicles many unknown and fantastical events that stir up feelings of dread. After all people are prone to fear what they do not understand. If this is so maybe it might help to know that the final book in the Bible is the completion of those same first 7 day steps and how they bring about a lasting peace and wholeness of self. As you read the book of Revelation you will see that EVERYTHING is illustrated with a strange series of events that are shrouded in symbolism. But what if learning to read these events was possible? Would this help take away the fear if it gave you peace of mind as a wonderful thing and not a time of woe? You see the last book of the Bible is really the completion of the 7 fold process, or 7 step journey that was established at the beginning of the book of Genesis. You might then notice that the number 7 is a theme that runs throughout the book of Revelation. Each of these 7’s are symbolic for a completion of the 7 step process that removes chaos from the world. It is simply illustrating how the uplifting of the mind is manifested. Once ignorance and confusion is defeated nothing remains but a temple of pure GOLD (Truth) that’s filled with LIGHT (Enlightenment) where there are no more DAYS (Stages of development) and there is no longer any more DARKNESS (Ignorance) and GOD (Higher understanding) reigns and dwells within. We fear what we do not know and this fear is an expectation that poisons the waters of the soul. It is only when we no longer live in ignorance that light is seen in darkness. Only truth can overcome the miseries of ignorance. The entire Bible is really a manual to overcoming the prison of the mind and only those that learn the universal truth (Cosmos) find the peace they seek. Rule the world as the god of understanding and create a new order that is no longer empty, ignorant and without structure… and then you will live in peace; with yourself, others and everything. There once was a man named Hunger because he was always hungry. Hunger was courting two women. One was named Passion because she was quick to act upon her impulses and desires, and the other was named Patience because she planned ahead to gain the things that mattered to her most. Hunger then made his choice between balancing out his Passion or Patience and chose whom he most desired to bring into his home. And as time went by their son Satisfaction was conceived, who grew to become a man and one day when Hunger ceased he took over the home and lived there with his wife called Joy. What was this story really about? Did you read it as a child or an adult? This story is written for two minds: The child mind that only sees the story is about a man who is dating two women, and the adult mind that sees behind the veil to the truth of the anamorphic characteristics of desire. When you read the Bible, ask yourself “Am I seeing this story through the eyes of an adolescent mind or that of a mature mind?” Because every name in the Bible has a purpose and the names are not arbitrary, nor are the titles of people or places. Everything is a hidden truth that is being read wrong by all the “children of God” whom see but do not perceive and hear but do not understand. It is only when you can see beyond the parables that you can find the truth that sets you free. Would you like to know how to read the truth hidden in plain sight? Or are you happy being a child without understanding and continue to miss God’s great gift?